Schlenkerla is an enduring local institution in Bamberg. Photo by Mark Dredge. Imagine a hot day in mid-August, high noon. You stand in a sun-baked lot gazing up at your destination: a thickly wooded hill 20 minutes drive south of Bamberg, in Bavaria’s Franconia region. That hill is the Kellerwald, and—symbolically, at least—it may represent the cradle of modern beer civilization. Two key moments here tell the tale. The first is when you leave the hot sun and, walking uphill, the temperature drops immediately as you step into the shade of the chestnut trees. The second moment is after enjoying an earthy-bitter, nutty-malted kellerbier, when—having asked politely —you get the chance to walk into one of those dim stone cellars that give this hill its name. And the temperature drops again, dramatically. This chilly place and uncounted others sprinkled around Bavaria are what made lagers, like the unfiltered kellerbier, possible in the centuries before artificial refrigeration. 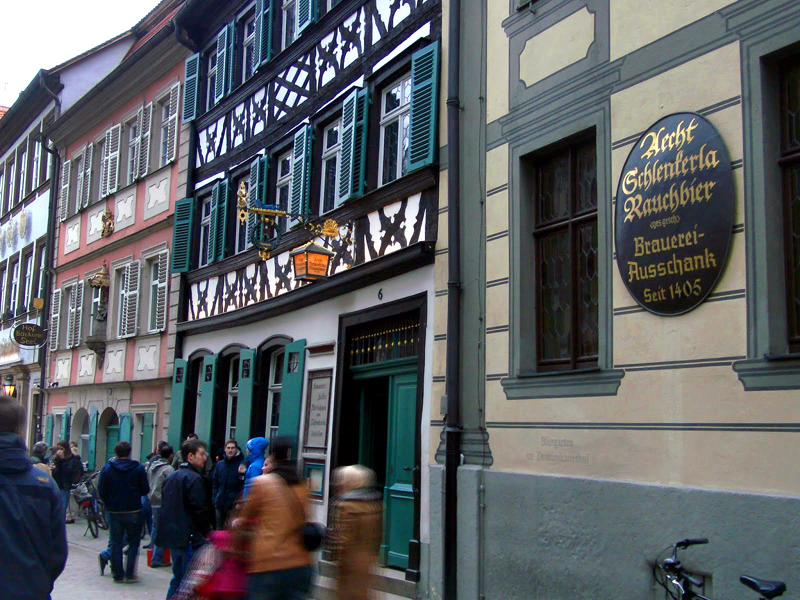 They are also a big part of what makes Bamberg and its environs such a playground for beer lovers. It all starts with that shade. There is a palpable difference between being under the cover of an umbrella and that of a sun-hogging tree like the chestnut. Leaving direct sunlight, the coolness of proper tree shade can be as abrupt as entering an air-conditioned room. Umbrellas and other artificial overhangs block the sun, but they do not absorb it for food. Umbrellas do not transpire moisture, literally lowering the temperature of everything below. Leafy shade is one of nature’s great coolants. Bavarian brewers knew it centuries ago. They planted chestnuts over their cellars—or else dug where shade was ample—cooling the earth and everything it sheltered. Their beers resurfaced in a way they liked. In those brisk underground passages, a domesticated fungus survived and thrived in batch after batch, showcasing flavors prized by its thirsty masters. That was lager yeast’s inexorable march toward becoming the world’s most successful sugar-eating animal. More than 90 percent of the world’s beer is bottom-fermented. With the invention of artificial refrigeration—and plenty of help from German migrants who fanned out across the globe with their favored yeast—the world chose lager. It still chooses lager. Few stop to ask why. The old-fashioned, full-flavored beers of Franconia—the kellerbiers, rauchbiers, or smoked beers, and other full-flavored lagers that defy easy categorization—offer an alternate narrative that has nothing to do with clever advertising or industrial shortcuts. Their suggestion is much simpler: Maybe lager first conquered the world because it was really damned tasty. But these beers are aloof—cool, let’s say—and they don’t care if you buy their story. They are content to multiply and be enjoyed, at home or abroad. Schlenkerla malts its own barley and kilns it over beechwood fires. 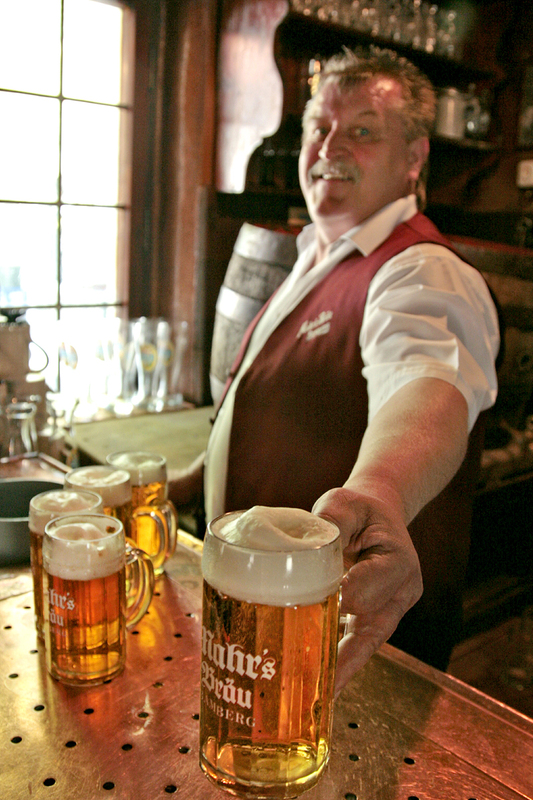 More famous than the region’s kellers and kellerbier, rauchbier leaves a lasting impression with most drinkers and travelers. Like the kellerbier, it offers a portal into the past, a time machine for our palates. 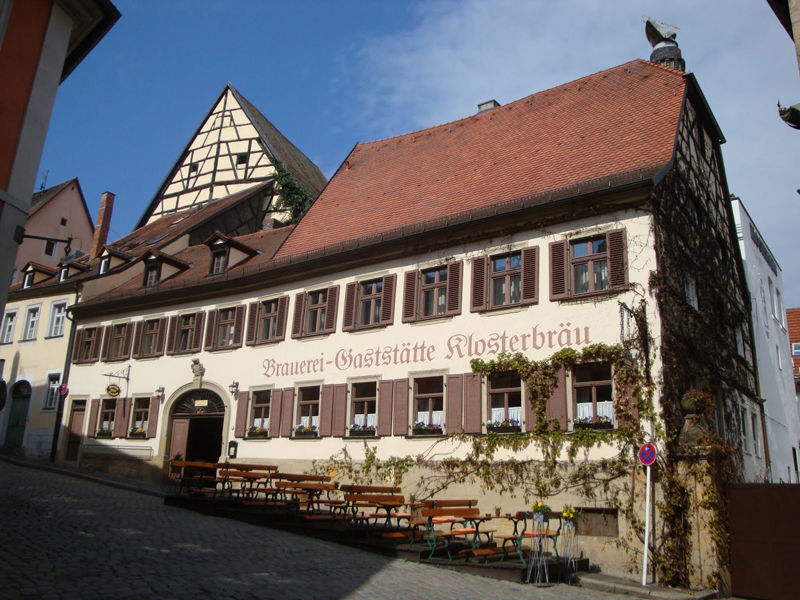 Its brewery is officially known as Heller-Bräu Trum and is up on the hill called Stephansberg. Known more commonly as Schlenkerla, the brewery is not usually open to visitors, although you can do like the locals and buy beer from a side door to take home. Schlenkerla’s fame is due to more than making the beer and running the pub. It goes a step further by malting its own barley and kilning it over beechwood fires to imbue it with that bacon-esque character. Many reckon that medieval beers, inevitably, would have had some degree of smoky character. 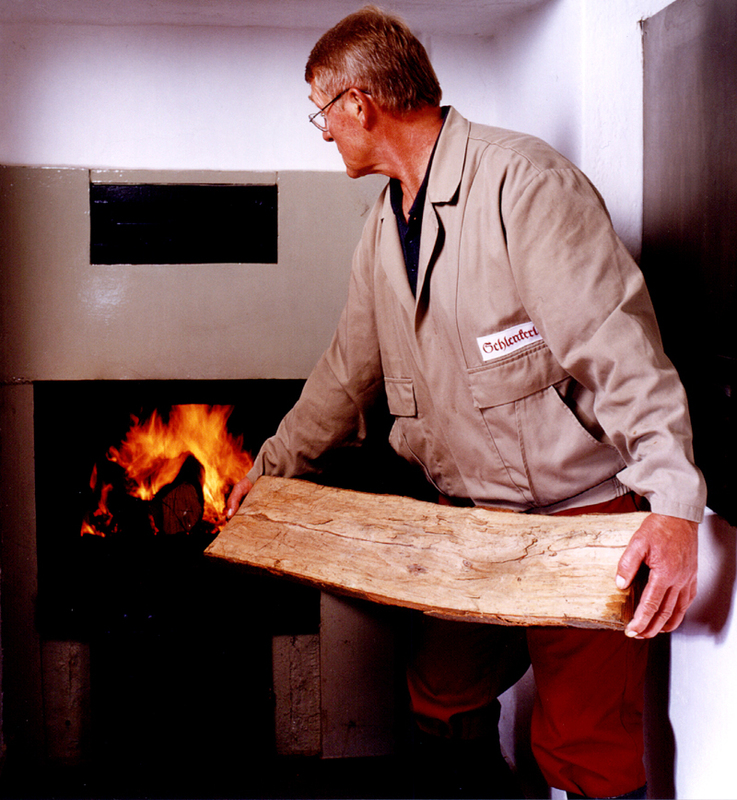 Clean-burning coke and indirect kilning were innovations that helped separate malt and smoke, the latter being an acquired taste that probably has gone in and out of fashion over the centuries. Just how many of those old beers would have been as smoky as Schlenkerla Märzen is another question. The flagship is made with 100 percent house-smoked malt, which gives it that deep, dark copper color. Yet it winds up plenty drinkable, the smoke finding that tricky balance with restrained sweetness and fair bitterness. For first-timers it usually goes something like this: The first smoked beer is downright odd. The second is a bit endearing. By the third you’re hooked. Plenty are hooked, and not only tourists or oddity-seekers. Schlenkerla is an enduring local institution. Mingling at its pub is a tradition. On weeknights in late summer, you find a crowd out front, milling about in the street, virtually all of them drinking the smoky Märzen, poured via gravity from the barrel into sleek half-liter Willi Becher glasses. Joining the crowd, you find that the great majority of them are young German speakers. Many, as it turns out, are University of Bamberg students hailing from various other parts of Germany. This bodes well for the future of Schlenkerla and other traditional beers. Klosterbräu claims to be Bamberg’s oldest brewery. Photo by Barry Masterson. 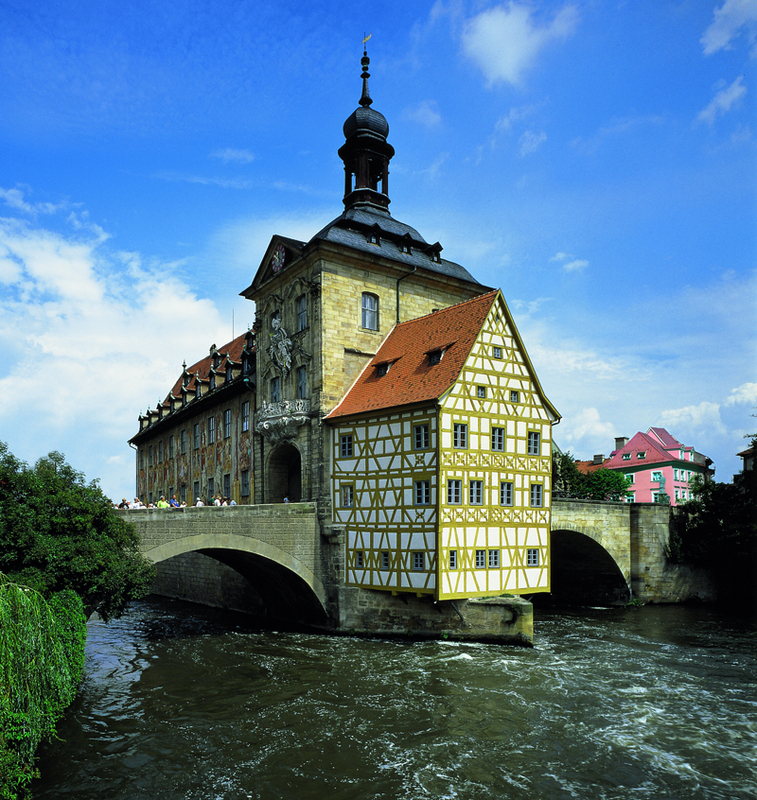 Bamberg boasts nine breweries for 70,000 citizens, or one for every 7,777 of them. That seems lucky. Schlenkerla’s dark-wood pub is timeworn and typically filled with eaters and revelers ready to share tables and swap stories. Besides the smoked Märzen, there is also the bottled Rauchweizen, equal parts wheat and smoked malt—gentler and more accessible than the flagship—plus varying seasonals that can include the stronger Urbock or oak-smoked Eiche. What to eat with your rauchbier: the Bamberger zwiebel, an onion stuffed with spiced pork, roasted and topped with bacon. A few blocks south of the famous Schlenkerla is Klosterbräu, which deserves more fame for its malty, lightly roasted, porterish, darker-than-dunkel Schwärzla—not to mention its claim to be Bamberg’s oldest brewery. Wooden beams, antlers and Franconian comfort cooking round out the setting. The Altes Ratahus. Photo courtesy Bayern Tourismus Marketing GMBH. South of there, on the Kaulberg hill, is Greifenklau. There has been a brewery here since the early 1700s, war and death occasionally interrupting things. 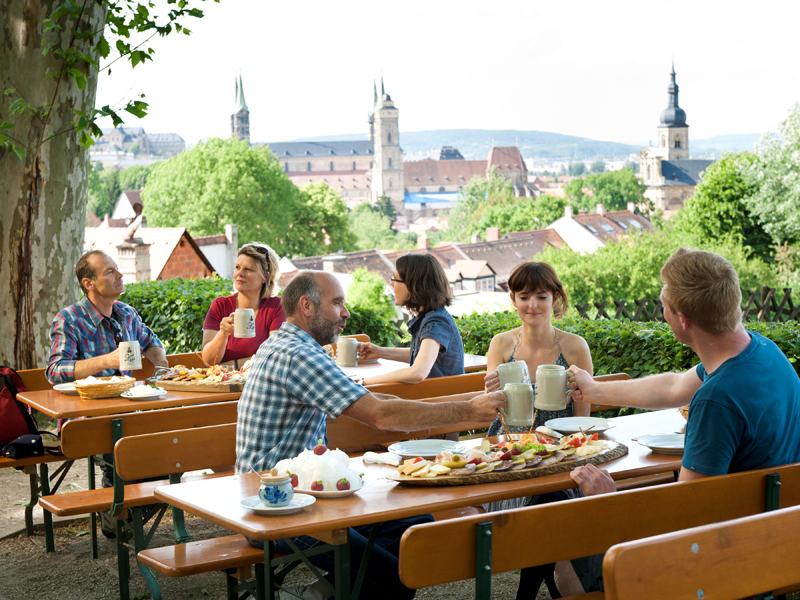 The leafy and venerable beer garden is one the most popular in town, thanks in part to a sweeping view that includes the Altenburg castle. Get here early to snag a table along the fence, or else pick one nearby and be ready to pounce. Its mainstay is the filtered Lager Bier, dryish, nutty-malty and pleasant. At first it seems too polished, then it becomes addictive. Yet with those ancient stone cellars three levels below, the lack of a more rustic, full-flavored kellerbier might be a missed educational opportunity. Spezial, the city’s other well-known maker of smoked beer, is about 15 minutes’ walk from Schlenkerla. Cross the river past the Altes Rathaus, the old city hall that sits, diplomatically, on neither side of the river Regnitz but on an isle in its midst. On busy Obere Königstrasse, Spezial’s half-timbered facade fronts one of the city’s coziest taverns. The main room is a celebration of wood paneling, cozy corners and the sharing of tables with strangers, aka new friends. Most drink the signature Rauchbier Lager, also made with beechwood-smoked malt but at a lower proportion than Schlenkerla. The result is more refreshing, with a subtler smokiness that many prefer. Directly across the street from Spezial is Fässla, whose brewery pub follows a common model in Bamberg: Pub rooms branch off from a central corridor, where there is an ausschank—basically a beer counter or window. Buy beers there and take them to stand-up tables in the small garden to hobnob with locals. The one most likely to be on tap is the Lagerbier, a deep golden showcase of malty nectar. On the same side of the river but 20 minutes’ walk southwest are two more brewery pubs, also neighbors to each other. Mahrs offers one of the most colorful pub rooms in Bamberg. Photo courtesy Bamberg Tourism. The tavern at Keesmann feels less worn than others, with scrub top tables, brighter wood and a fresher feel that even those antlers on the walls can’t age. The beer garden in back is popular in summer, with options for table service or self-service from the window. The classy Herren Pils is grassy-hopped and dryish, while the amber, unfiltered Sternla lager offers chewier, maltier depth. Finally, across the street and behind the church is Mahrs, which ought to be considered a German national treasure. It features one of the most characterful pub rooms in Bamberg, with its dark wooden beams and benches, paneling and green-tile kachelofen, a traditional stove that warms the room in fact and not just in personality. Visitors to the corridor might find the Stehgammler, the world’s only known standing Stammtisch—a dedicated group of regulars who are fully aware of their good fortune in being able to call this their local. Two others, Kaiserdom, the largest in the city, and Ambräusianum, a brewpub, round out the lot. Yet the real star here is not the pub, nor its regulars, nor even its shady beer garden. The beer is the thing, especially the hazy, unfiltered, orange-copper kellerbier known locally as simply U. The Ungespundet is dryish, grainy and fairly bitter, its most distinctive trait being an intriguing, hoppy fruitiness that tastes of orange zest. It is highly addictive and best on gravity from the barrel. The U, to put it plainly, is one of several beers in Bamberg that show what lager can really do. Hills are good places for lots of things—castles like the Altenburg, or abbeys like the one on Michaelsberg. The latter is also home to the Franconian Brewery Museum (open 1 p.m. to 5 p.m., Wednesday to Sunday, April to October), offering an amusing stroll past several levels of old barrels and brewing equipment. Explanations are lacking, even in German, but here and there are clues to piece together. For example, an old photo shows workers breaking the ice off a frozen lake, to be hauled by train to a keller somewhere. Visitors at Spezial-Keller enjoy beers from Wilde-Rose and scenic views. Photo courtesy Bayern Tourismus Marketing GMBH. On Stephansberg, farther up the hill from Heller-Bräu, is the city’s most impressive beer garden, the Wilde-Rose Keller. This is another former brewery, and indeed there are stone cellars below. Numerous ancient chestnuts provide a thick blanket of shade on the large property—big enough for 1,500 people, the owners say, but that seems conservative. Adding to the grandeur is a large restored bandstand that lends 19th-century credibility. At the back of the garden is a large sand pit playground (see sidebar), with plenty of tables for parents to sip beer and watch the tots. At the front are three counters: one for food, another for lager and a third for bottled wheat beer and juices. Pretzels are freshly baked and crusty, their ample salt forming a pact of mutual encouragement with the beer. The lagers at Wilde-Rose include Keesmann Herren Pils, Schlenkerla Märzen, and the Wilde-Rose’s own Kellerbier. The man at the counter insists it is “self-brewed,” which is nonsense. Some report that Keesmann makes it; others swear it’s from Löwenbräu. Does it matter? The beer is pleasantly bitter and dry with wisps of grainy malt, rustic enough to ponder man’s place here on earth, between the leaves and the caves. A short walk downhill is another popular beer garden, the Spezial-Keller, affiliated with the brewery of the same name. The Wilde-Rose might be more impressive in itself, but it has no view; from Spezial-Keller you can see the Dom, the Michaelsberg abbey, and more spires besides. There are options for self-service or table service. The menu includes a regional classic: Schäuferla, a thick cross-section of roasted pork shoulder complete with crispy skin. Smaller, simpler dishes are available, too, all washed down with that cool, pale smoked lager. There is a small playground as well. There are uncounted other kellers—as in beer gardens—dotted around the Franconian countryside. Many are connected to breweries, like Roppelt’s Keller, on the edge of the forest near Hallerndorf. Here is yet another quality kellerbier, simultaneously grainy, bitter, fruity and dry. The large, shady garden and its beer appear to be very popular with the locals, packed on a Thursday afternoon. They are amused that tourists would find it. The playground here is one of the largest around. Then there is Forchheim’s Kellerwald, whose options include Löwenbräu Kellerbier from the barrel in the deep, cool shade at the Rappen-Keller. There are 23 kellers on this hill in all. A few of them, with pubs, roofs and everything, are open all year. Some are only open in summer, while several more open only for the Annafest, a 10-day folk festival in late July that celebrates kellers and kellerbier more than it does St. Anna. This is the story: Pilgrims would visit St. Anna’s chapel in the 16th century, stopping to cool off in the Kellerwald with the beer that was kept there. Maybe it was a touch smoky. Certainly it was unfiltered. But those pilgrims knew something that the students in Bamberg knew, too, and the brewers knew best of all: There was nothing to fear in the shadows. Joe Stange is a freelance journalist and co-author of Good Beer Guide Belgium (7th edition, with Tim Webb) and author of Around Brussels in 80 Beers (2nd edition, Spring 2015). Nice. Only one thing to update: Gänstaller brews at the old brewery owned by Friedel in the village of Schnaid near Hallerndorf; the tavern they used to run (until Dec 2013) was in Strassgiech. Although that place *was* a brewery until the 1960’s, Gänstaller never brewed there. They were more or less forced out of that place by the owner placing unreasonable demands on them, being a looney.